We are continually adding plant lists from MNPS field trips. Check them out to recall the beauty and diversity of the region from past years. If you have lists from MNPS field trips, please volunteer to submit them. Deer overpopulation is a major threat to native plants. Learn more at Irvine Nature Center Saturday Nov 12, 9am-noon. See explorenature.org for details. Marilandica: The Fall issue is out. Check your mailboxes for our latest issue. It's also available for download to members only. The latest issue of Marilandica (Vol. 2 No. 1) has been mailed. It may take time for the Post Office to deliver it, as it is sent "Standard Mail" (also known as bulk mail.) But members can log in and read it on line!. The issue includes some field trips, but our Events page and Meet Up site have the most up to date listing of field trips. This year's fall conference will be held on Sat., Sept. 24 at the College of Southern Maryland, in La Pata (Charles County) co-sponsored by the Biology Department. Registration is open--check out the event page: 2011 Fall Conference Details on the speakers and field trips will be added as they are confirmed. Sept. 24 is National Public Lands Day so our field trips will highlight the role parks and other public lands play both ecologically and socially. Yesterday was a beautiful day, even if quite blustery, to explore the woods and wetlands of Patuxent River Park. After more than 15 years of working with PRP staff on river-based programs, it was wonderful to explore this park; and with two wonderful naturalists as co-leaders. Greg Kearns, the park naturalist for over 30 years, shared so much knowledge about the site and was able to describe what will fill in the brown spots as the season progresses. PRP is fortunate to have gained a new volunteer, Esther Woodworth. She is an awesome person to be out in the field with--look for her to lead more hikes at the park this year. Here is the list of "Winter Greens" we saw (anything green, besides beer bottles) are on this list. If I forgot something, please add it as a comment. (a) means non-native. The good news is that this isn't a stream in Alexandria, Arlington, Fairfax County or even northeastern Indiana (although we certainly have some contenders)! 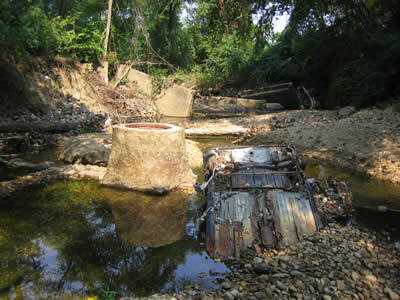 The bad news is that it's still in the greater D.C. watershed (let alone anywhere on planet Earth)! A small area of forested serpentinite glades near the Potomac River on the upper slope and terrace above Watts Branch (east side), Montgomery County, Maryland with some characteristic ultramafic indicators (when in association), such as Northern Red Oak (Quercus rubra), White Ash (Fraxinus americana), mixed grasses - mainly Rock Muhly (Muehlenbergia sobolifera) and Bosc's Panic Grass (Dichanthelium boscii), and scattered colonies of Leonard's Skullcap (Scutellaria leonardii). This site is a small continuation of the much larger Travilah Serpentine Barrens approximately 3 miles to the north. 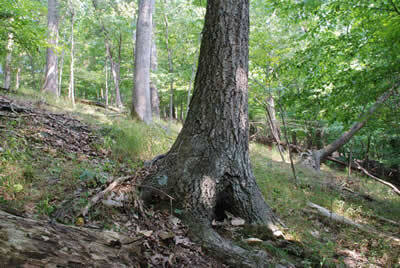 Northern Red Oak in serpentinite glade above Watts Branch, Montgomery County, Maryland. Photo by R.H. Simmons. Old place names nearby also denote the limits of the once-vast serpentine barrens that occurred at Travilah, such as Big Pines, Quince Orchard (generic name for Rosaceae plants common to serpentine like Wild Crabapple and Hawthorne), and Greenbrier Creek (we mostly avoided crossing an impenetrable portion of this on the Winter Solstice Walk!). The enormous serpentinite quarry adjacent to the Travilah site is referenced in the paper below as the "Hunting Hill" quarry. Forty-one of us from the Maryland Native Plant Society, Virginia Native Plant Society, and Arlington Regional Master Naturalists - or member of all three as Cris Fleming pointed out! 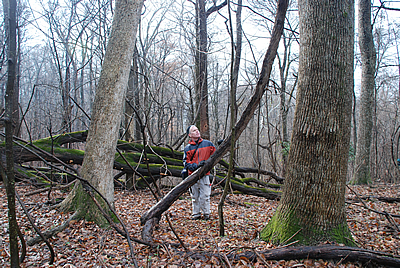 - met on a cold December 19th for a hike and traditional solstice hooley at the exceptional Travilah Serpentine Barrens in Montgomery County, MD, the mid-Atlantic region's finest example of a globally-rare, forested serpentinite community. Thanks to all who braved the cold and brought good cheer to the walk and toasting ceremony. This year's offerings were the heavily-peated, bog-and-sea coast inspired Ardbeg and Clynelish drams, as well as Knappogue Castle Single Malt Irish Whiskey and a fine French rum (compliments of Tom Raque). We were also glad to have the MNPS and VNPS state and Potowmack Chapter presidents with us. 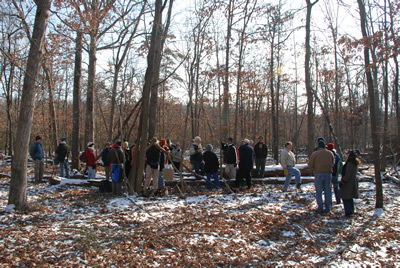 2010 Travilah Barrens Winter Solstice Walk participants gathered in Post Oak (Quercus stellata) glade. Photo by R.H. Simmons. Much of the vegetation that occurs on the olivine-rich serpentinite (dunite) at the Travilah Serpentine Barrens in Montgomery County is probably most appropriately classified as "Ultramafic Woodlands and Barrens", which is a natural community type within the "Low-Elevation Rock Outcrops and Barrens" group within the "Terrestrial System" category (see http://www.dcr.virginia.gov/natural_heritage/ncintro.shtml and http://www.dnr.state.md.us/wildlife/Plants_Wildlife/Md_Veg_Com/toc.asp). The relative abundance and co-dominance throughout the site of Post Oak (Quercus stellata), Northern Red Oak (Quercus rubra) - in sections, Blackjack Oak (Quercus marilandica), Shortleaf Pine (Pinus echinata), Virginia Pine (Pinus virginiana), and Little Blue Stem (Schizachyrium scoparium) - dominant grass under powerline - are strong indicators of this type. [Little Blue Stem when greatly abundant/dominant is a good indicator of ultramafic soils, like those derived from serpentinite, while the abundance of Indian Grass (Sorghastrum nutans) in places like Manassas Battlefield Park, Hoyles Mill, Gettysburg, etc., is a good indicator of underlying diabase (mafic rock) and Triassic Basin soils. Magnesium is very high in serpentine soils, but calcium levels are very low. Diabase soils are generally high in both calcium and magnesium.] Other distinctive plants when in association that frequently occur throughout the site in woodland glades with the above are: Wild Crabapple (Malus coronaria), Hawthorne (Crataegus spp. ), Deerberry (Vaccinium stamineum), Bosc's Panicgrass (Dichanthelium boscii), and Leonard's Skullcap (Scutellaria leonardii), among numerous others. Hiking up the powerline at the Travilah Serpentine Barrens through prairie-like community dominated by Little Bluestem (Schizachyrium scoparium). [The other grass that resembled Broomsedge (Andropogon virginicus) and occurred fairly frequently under the powerline was Elliott's Bluestem (Andropogon gyrans)]. The powerline maintenance folks - PEPCO? - need to zap the Phragmites colonies that're growing in a couple of isolated cells in seasonally-wet areas under the powerline, in addition to carefully controlling a few other weeds before they get going. Generally, the site is remarkably free of invasive exotics. 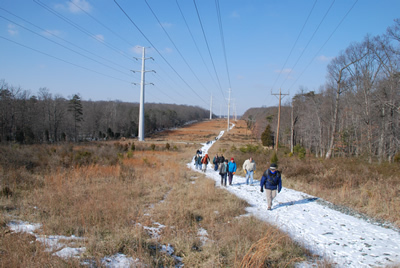 Powerline at Travilah Serpentine Barrens, Montgomery County, Maryland. Photo by R.H. Simmons. Marty Nielson and Old-age Vitus vulpina (Frost Grape) at Chapman Forest North. Photo taken on Winter Solstice Walk.